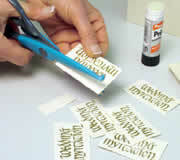 You will need: Flat Card or Paper, Rubber Stamp, Embossing Pad, Embossing Powder, a wide container, spoon, small paintbrush, Deckle-edged scissors and a glue stick. 1. 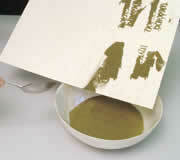 Empty embossing powder into wide container for ease of use. 3. 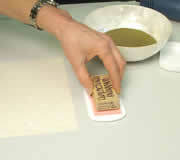 Press wet stamp evenly and firmly onto card/paper. 4. You can repeat the process several times. 5. 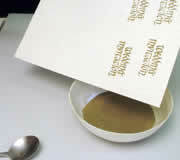 Then cover the wet stamped images completely with embossing powder. 6. 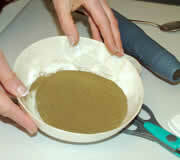 Gently tap off the excess powder back into container for re-use. 7. 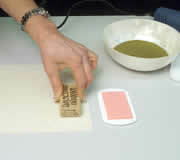 Powder will cling to the stamped image. Remove any stray powder with a small, dry paintbrush. 8. 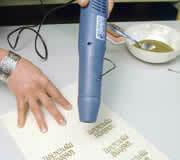 Warm up the heat gun and hold over each image until just melted. Do not overheat powder. 9. Using deckle edged scissors, cut out each image. 11. Hey Presto! 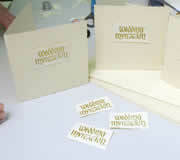 YOU CAN, OF COURSE, STAMP AND EMBOSS DIRECTLY ONTO YOUR FOLDED BLANK CARD, MAKING THE PROCESS EVEN QUICKER AND SIMPLER.